This Application works best with Microsoft Internet Explorer version 10 or later.The version that you are using is older than the supported version. This Application works best with Chrome version 30 or later.The version that you are using is older than the supported version. This Application works best with Firefox version 23 or later.The version that you are using is older than the supported version. 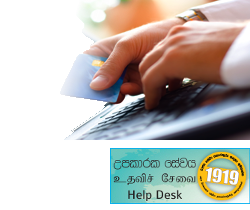 Welcome to the Colombo Municipal Council Online payment Services. You can pay your due payments through this service for the payment types that do not require any supplementary documents/ manual interventions. You are required to provide the CMC Account number for which the payment is to be made and the corresponding Street name and Assessment number in order to make the online payment successfully. Log in to select the payment type and to proceed with the payment. Rates payments, Trade Tax, Tax on businesses, Market Rental, House Rental, Shops and Boutiques Rental, Hawkers Rental are the currently available online payment types. Copyright © 2013 ICTA, Information and Communication Technology Agency of Sri Lanka. All Rights Reserved.